Of the never ending list of Thai desserts and khanoms, khao lam (ข้าวหลาม), in my opinion, should rank pretty high up. And even for being a person who’s nearly always thrilled to fill myself on the main dish without touching dessert, I can always make space for a few bites of khao lam. What is Khao Lam (ข้าวหลาม)? There are two main versions, one made with normal white sticky rice, and the other made with black sticky rice (khao neow dam). I prefer the latter. 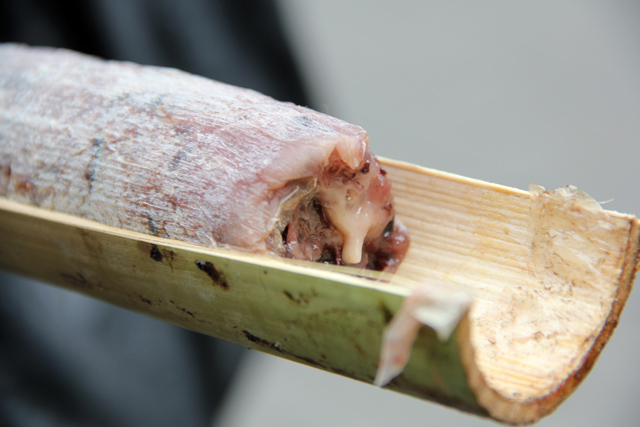 The sticky rice is mixed with sugar, sweet red beans, and coconut cream and then stuffed into cylinders of hollow bamboo. The tubes filled with goodness are then slow roasted over coals as they slowly cook and the ingredients mingle together. Khao lam (ข้าวหลาม) is not always easily available in Bangkok, but it’s very popular to purchase in Nakhon Pathom and Bang Saen, both about an hour from central Bangkok. 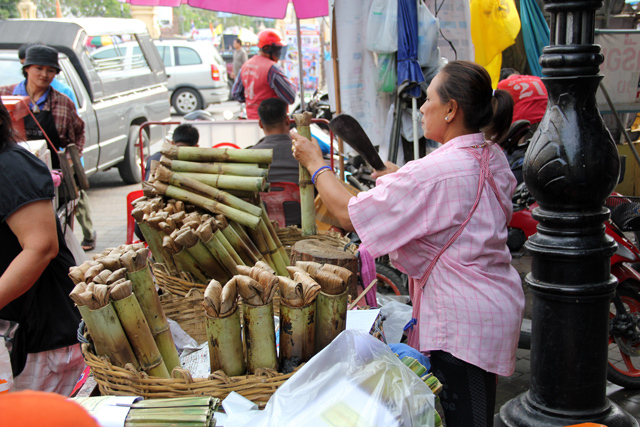 As soon as you order a baton of khao lam (ข้าวหลาม), the vendor gives it a swift whack with a hammer or knife, making it convenient to pry open the bamboo and dig into the treasure. 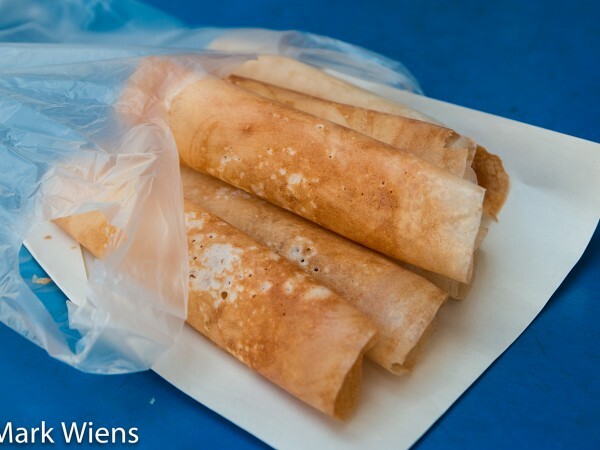 Hiding in the tube is a lump of delicious sticky rice cake! The top part is custardy, extremely rich, quite sweet, and really good. The bottom is less sweet and the grains of rice tend to be a little more separated from each other. The mixture of both the head and the tail creates a perfect harmony. 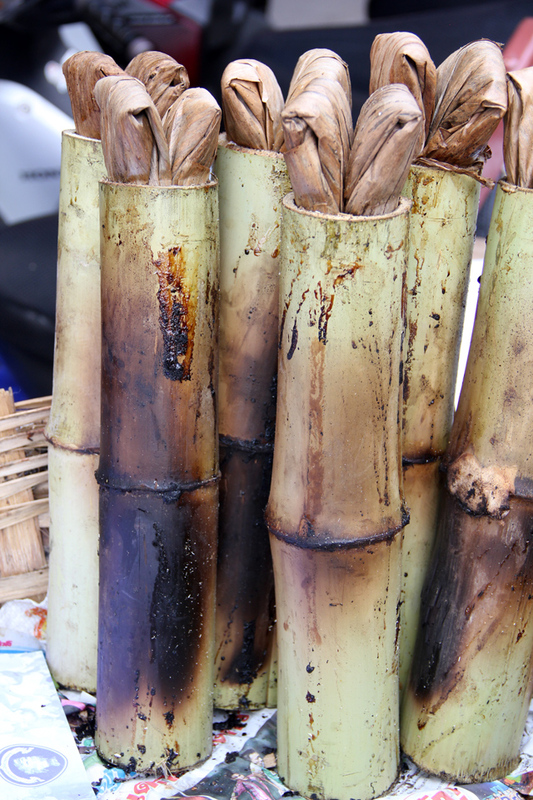 It’s sweet and creamy and there’s an earthy element from being slow cooked in bamboo. 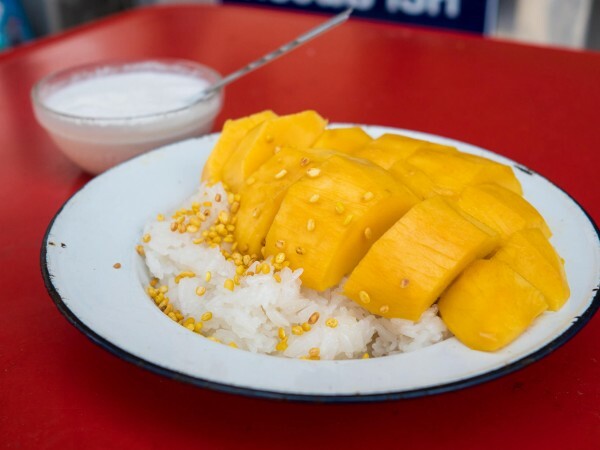 Perhaps the only thing that could make khao lam better is if there was a durian version – which I have yet to see, but have contemplated asking a vendor to make me a special batch. Be careful, khao lam (ข้าวหลาม) is like a meal in itself; Eat a couple bamboo pipes without thinking about it, and you’ll find yourself stuffed, and happy too! 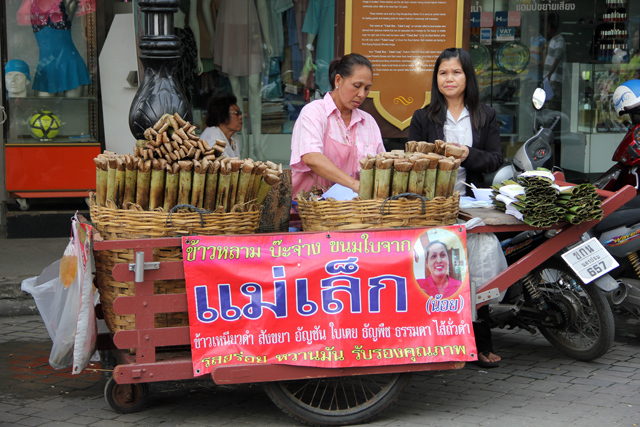 And here’s a video of khao lam… Enjoy! 5 comments. I'd love to hear from you! Yay just had one handed to me for breakfast… After a quick search found out what I needed to know…. But shouldn’t have bothered.. It was delicious… That’s all I really needed to know…..
I’m very interest to learn how to make khao lam. Where to find best teacher? Hi Shinta… that’s a good questions… it’s definitely an art to make it!